Walking into my home right now you would be greeted with the sweet smell of freshly (and not so freshly) picked peaches … mmmm. I am obsessed with peaches. To me these juicy and vibrant lovelies represent my childhood- picking and eating fresh peaches from my grandma’s peach trees and eating her delicious peach pie and cobbler. However, it also represents the bitter sweet transition of summer to fall. During this time- I go into extreme panic as the last of the local peaches begin to dwindle. I can’t help but buy boxes and boxes of peaches from the local orchard…. It’s great! Except for one problem. After filling my freezer and doing all the great How Does She suggestions of what to do with peaches here, here , and here, – I still am finding myself lost in mounds and mounds of peaches! 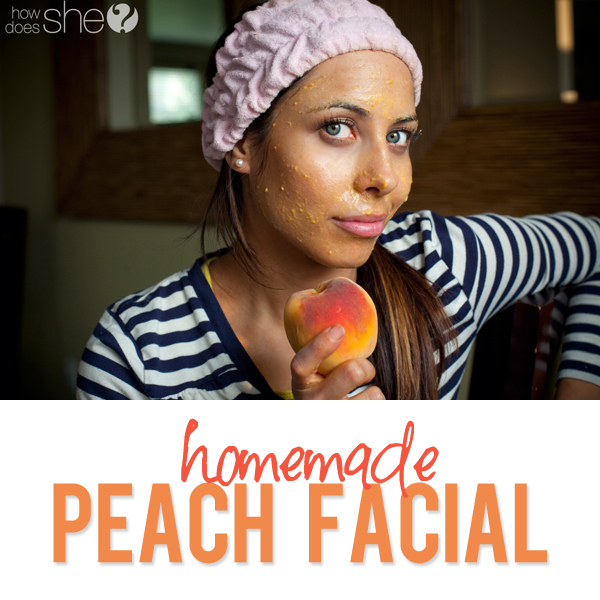 Peaches are packed with vitamins and I have heard they are great for hydrating the skin. First thing is first- grab a friend! Find someone to do the facial with- so much fun to do it together! My little helper is going to show us how it is done. 4. Add the egg yolk. 5. Mush or blend it all together and apply on face. Let me tell you that my face was left feeling so smooth, tight, and soft. I just couldn’t believe it! I just think I may try more at home facial masks with the left over produce…hmmmm what about squash, zucchini, or tomato? Not as appealing as peaches…but I just may give it a whirl! What garden produce are you left with? Try it out and let me know how it goes! very cool. gonna try this tonight. I am so trying this. I might eat my face though. I LOVE the smell of peaches. I love the peach mask and all your blogs. Give my blog a visit, I am just getting started! How long should you leave it on? I really love the peach remedy Im gonna try it at home tonight. This is a great way to save your peaches without it being spoiled.